My two-and-a-half-year-old son and I hear a “chip, chip” as we do yard work one recent late morning. “Can you tell me what bird that is?” I ask him, pointing to the bobbing black head of the small bird flicking leaf debris along the path. “Junco!” he shouts. The dark-eyed junco is a ground feeding bird, commonly seen in Seattle yards. Juncos, along with many other local resident and migrant birds, find food and shelter in the rich ground cover and forest canopy in our city. Birding is a visible, engaging and natural way to connect with wildlife right in your own backyard, while engaging a child’s senses. You can do it, too -- here are four tips to get started. I grew up in Seattle’s Lake Forest Park neighborhood. For most of my childhood, screech owls nested every summer in the box my dad had put out on a cedar tree before I was born. The owl parents came for years, and at dusk we’d hear their gentle, quiet “hoo-hoo,” as night fell. Their vocalizing was the soundtrack of my childhood summers. Now, as a mother, I want to bring my son Vireo (yes, he's named for the bird) into the sensory experience of birding. And we started early! Since he was an infant, I have identified bird song to him, and pointed out what we are seeing whenever a bird visits our yard or flies overhead while we are out driving. He has become an excellent spotter as a result, able to see birds before I do, whether or not he knows what he is seeing. Often the birding is circumstantial — while we are doing yard work together or playing in the sandbox. Once we stop and look closely at our surroundings, we start to see and hear more, cut through the layers of white noise and distraction and notice the life all around us. I don’t always worry about identifying the bird — it is the activity of seeing and observing that is the fun part for kids. 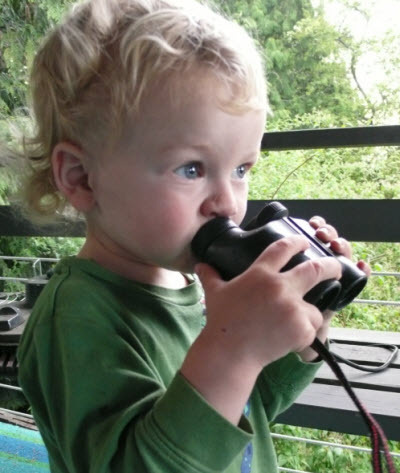 When watching birds, let kids know to keep a respectful distance (never intentionally intrude on birds in order to “see better” or “get a good photo”). The more we let birds be themselves in our yard, the more comfortable they will feel and the more often they will visit. And once birds are comfortable, they will allow you to get closer as time goes by. Feeders are a wonderful way to create a space for you and your child to watch birds. Putting up feeders will really bring these birds out of the bushes, literally! Seeds attract finches, chickadees, nuthatches and sparrows, for example. Suet will attract bushtits and woodpeckers. A hummingbird feeder will attract hummingbirds of course! Feeders are available everywhere from hardware stores to specialty nature shops like Seattle Audubon and Wild Birds Unlimited. I like to support the latter two places, as their staff is knowledgeable about birds and supplies and can answer questions. Here are some important tips for inviting birds to safely enjoy your feeders and yard. - Buy a feeder which can be easily cleaned (taken apart and scrubbed twice a year at a minimum to get rid of mold). Clean often underneath the feeder to discourage rats and squirrels. - Place a seed feeder in an area where there is tree or shrub cover for a bird to retreat in case there are predators around (such as a hawk). - Place a feeder well away from windows where a retreating bird might strike glass. - If there are cats in your yard, place the feeder in a place inaccessible to your feline friend. Better yet, make your cat an indoor cat. - Buy a dome cover to protect the seed feeder from rain, which accelerates mold developing in your feeder. 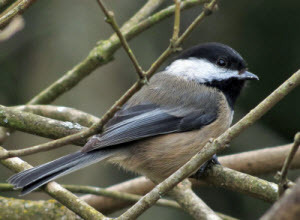 Here is a quick list and description for some of my favorite commonly seen, year-round resident birds that you can see in your yard and creek side environs around the Seattle urban and suburban areas. - Bushtit: Smaller than chickadees, bushtits travel in groups like swarm of adorable flies; makes distinct twittering vocalization as they move around; they are a mid-canopy bird, and will come to suet but not the seed feeder. They make pendulum-style nests from all sorts of found objects and fuzz, including drier lint and spider webs. 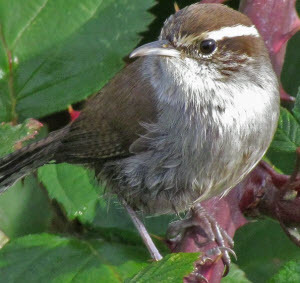 - Bewick's wren: Feeds on the ground and lower canopy of woods, has a sassy little tail wagging and a distinct white eye stripe and scolding style of vocalizing. 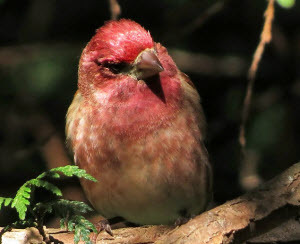 - House finch: Reddish head and shoulders, comes to feeders. 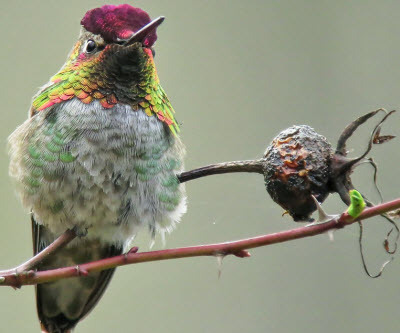 - Anna’s hummingbird: A green hummingbird that lives year round, relying heavily on feeders in winter. - Brown creeper: A tiny brown bird that travels up a tree trunk looking for insects, mid-to-high canopy. 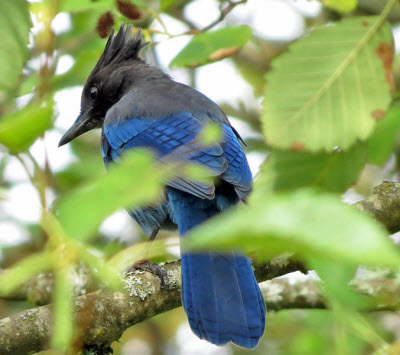 - Stellar’s jay: Often called a “blue jay” in error, for its brilliant blue color and definitive crest, all levels of the canopy. - Ruby-crowned kinglet: A solitary bird with a “hover gleaning” feeding style. A distinct white patch around the eye gives this bird a dreamy look, and they are very curious and flirty if you are near and respectfully still. - Dark-eyed junco: A ground feeder, often in groups, that feeds beneath feeders. - Towhee: A ground feeder, which can be found lower to mid-canopy. You can look in your bird guide (see below) for a visual reference and that way feel more confident about what you are seeing. Be sure to find a guide that is specific to the Northwest United States, as some species can vary in appearance depending on the part of the country where they reside. There are many interactive opportunities for engaging your child and yourself in learning more about birds. 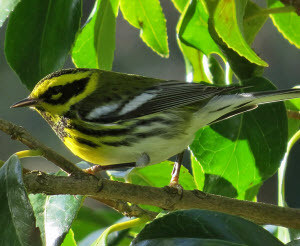 - This weekend, from Feb. 15-18, Audubon hosts its annual Backyard Bird Count, the commitment is only 15 minutes a day. Even more incentive to get started birding right at home! - Seattle Audubon hosts year-round free neighborhood bird walks at Seward and Discovery Park, as well as other parks. These are a great way to learn about birds from a master birder in a casual, all-welcome way. Also check Seward Park Environmental Audubon Center for upcoming family bird walks, Eastside Audubon, and, in the South Sound, Tahoma Audubon. - Check out Birdweb, for specific information about birds here in Washington State and information about when and where you might see a particular species, such as migratory birds that spend only parts of the year in our area. - A great resource for birdsong and other information on a more national level is Allaboutbirds.org. Run by the Cornell Lab of Ornithology, this site has thousands of recordings of birdsong. - Listen to Bird Note on KPLU 88.5 every weekday morning at 8:57a.m. (or listen from the archives). Bird Note features the recordings of birdsong from all over the world, but with a focus on birds of the US. This program is strong for its introduction to birding by ear and context for what you hear. - A good bird guide will be a great investment. I like the now-classic David Sibley guides, for the different illustrated views of each bird. I use the volume specific to the Western North America. Whatever guide you choose — whether it is illustrations or photographs — make sure it is specific to Western North America. - There are many bird guides available now that even focus just on the birds of Washington or Seattle. Poster or brochure guides are a convenient way to keep information handy and visible for short notice birding. With these tips in mind, a whole new world opens in your own backyard. Enjoy your feathered neighbors! About the author: Bryony Angell grew up in Seattle and enjoys sharing the hidden gems of her native city with others. She lives in North Seattle with her family. About the photographer: All the photos of the birds in the article (no people) were taken by Mike Hamilton. Mike is one of those wildlife photographers who likes to do it the hard way — "digiscoping.” But he carries it to masochistic levels by not using an adapter. His favorite birds are those that stay in one place, at least for a few seconds! The photo of the boy at the top of the piece was taken by Bryony Angell. 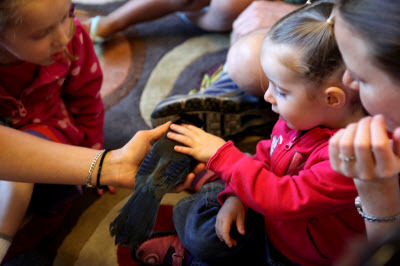 The photo of the toddlers with a Stellar's jay was courtesy of the Seward Park Environmental & Audubon Center. Identification of birds in the photos: In order, male purple finch, male Anna's hummingbird, black-capped chickadee, Bewick's wren, Stellar's jay, and male Townsend's warbler.